Arrive at Delhi International Airport. Welcome on arrival and transfer to the hotel. Overnight at hotel. Early morning transfer to Delhi airport for flight to Nagpur. Upon arrival, drive to Pench National Park whose glorious history is well known to readers of the famous Jungle Book by Rudyard Kipling. Indeed, it is this country that the author chose to write his story. In 1977, the park was declared a sanctuary in times and recognized as National Park and later received the title of Tiger Reserve. Pench National Park is famous for its large herds of mammals including predators feed, helping to maintain a balance between species. The bird life is very diverse between resident, migratory and endangered. As flora with over 1200 species of plants, flowers and trees identified. Afternoon safari in the park. Overnight at hotel. Jeep safari day in the park (one in the morning, one in the afternoon). Overnight at hotel. Morning drive to Kanha National Park, one of the most beautiful wild Asian reserves established in 1955. The park is behind the preservation of many animal species and in particular strongly supported the campaign Tiger Project. Originally, the park was designed to save a species of rare deer, deer Duvaucel threatened with extinction. Since then, many of the flora and fauna conservation programs have been put in place and this park protects both sedentary species as migratory. Afternoon jeep safari in the park. Overnight at hotel. In the morning, return to the park for a jeep safari. Then, depart by road to Bandhavgarh National Park 265 km away, a former hunting ground of the Maharajas of Rewa, now one of the finest in India. Declared a national park in 1968, it has the distinction of hosting the largest concentration of tigers of all parks in India and is famous for being the birthplace of the famous White Tiger of Rewa. Overnight at hotel. Safari elephant in the morning. Then, early in the afternoon, drive to the airport and flight to Delhi Jabalpur. Welcome on arrival and transfer to the hotel. Overnight at hotel. Morning transfer to Delhi airport for flight to Guwahati. Upon arrival, continue by road to the Kaziranga National Park, located in the state of Assam on the banks of the Himalayas. Covering an area of 430 square kilometers, it was first nature reserve and became a National Park and since 1985, it is a Unesco World Heritage site. The history of this park is closely linked to the wife of the Viceroy of India, Lady Curzon, who one day in 1904 while visiting this place, decided it was absolutely necessary to protect the rhinos. A planning program for their protection was then launched. It is in this park that found two-thirds of the horned rhino population of the planet. It also contains the highest density of tigers in the world and other major communities: Asian elephants and water buffalo. Afternoon jeep safari in the park. Overnight at hotel. Safari elephant in the morning. Jeep safari in the afternoon. Overnight at hotel. Morning safari on elephant back. By late morning, drive to Guwahati airport for flight to Delhi. Arrival transfer to the railway station in Delhi and boarding the express train to Sawai Madhopur night. Overnight on the train (sleeper). Early arrival and drive to Ranthambore National Park. 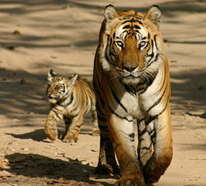 Ranthambore, one of the five parks that make up the Rajasthan was created in 1973. Before that, it was the former hunting ground of the Maharajas of Jaipur declared a nature reserve in 1955. Renowned for its abundant population of tigers s is easily developed because of Project Tiger, it offers incredible visibility of its wildlife to visitors. Besides tigers, hyenas, leopards, crocodiles, chital (spotted deer), antelopes and more than two hundred and sixty species of birds. Jeep safari day in the park (one in the morning, an afternoon). Overnight at hotel. In the morning jeep safari in Ranthambore Park. Then, in the late morning, back to the Sawai Madhopur station to take the train to Bharatpur. Upon arrival, drive to the National Park of Bharatpur. National Park Keoladeo Ghana or Bharatpur Bird National Park, covers an area of 28 km2 and consists mostly of wetlands. Found in the park over three hundred and fifty species of birds. Hundreds of thousands of migratory birds from China and Siberia spend the winter. Bharatpur park is known to be among the finest bird sanctuaries in the world and has been a UNESCO World Heritage Site in 1985. Afternoon visit to the park by cyclo. Overnight at hotel. Departure to the Sariska National Park, formerly hunting reserve of the royal family of Alwar, which covers an area of 800 km². In addition to the flora and fauna that are usually found in these parks, it is advisable to visit the Neelkanth temple and the Sariska Fort of the 17th century and offers panoramic views of the reserve. The area was declared a sanctuary in 1955 and became a national park in 1979. The Sariska park is also known for its large population of Rhesus monkeys. But the main attraction is of course the Tigris. Afternoon jeep safari in the park. Overnight at hotel. In the morning jeep safari in the Sariska Park. Then, drive to Delhi International Airport for return flight. The cottages are charming, well furnished and comfortable and the staff is very caring. The property has a large garden with pool. Its location is a plus that makes it very relaxing and serene. The Lodge is located in the heart of the tribal village of Narna, a few minutes drive from Kanha Park. Beautiful architecture with local materials and natural elements. Friendly staff, warm and welcoming. Elegant and comfortable rooms. Warm welcome. Staff very friendly and attentive. Very spacious and comfortable. Pool and spa. A new green complex located just at the entrance of Kaziranga. Property well maintained. Cozy, spacious and clean. A beautiful place.